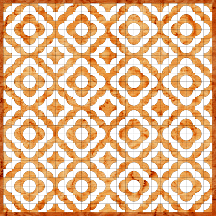 Templates to print on fabric (or paper) for Drunkard's Path Quilts. This Inklingo PDF includes these 2 shapes and 2 bonus shapes (below). You have a choice of 6 SIZES! The two bonus shapes make more designs possible. There are dozens of worksheets and many variations in The Inklingo Drunkard's Path Design Book. They don't necessarily look like traditional Drunkard's Path. Kirsten in Denmark designed this lovely Drunkard's Path variation for her granddaughter. Kirsten has been an Inklingo quilter from the very beginning in 2006. As Kirsten wrote: "It could not have been done without Inklingo!" Isn't it lovely? Kirsten said she really missed Inklingo for the triangle border! Those shapes are not inklingo-able (yet), so she used freezer paper templates à la Quilted Diamonds. Thank you, Kirsten! You are an inspiration. The Drunkard's Path Design Book (half price or free, 203 pages) will help you sew a Drunkard's Path quilt, whether you are following a traditional pattern or designing your own variation. 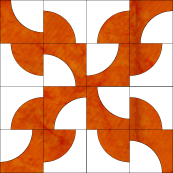 It is an amazing resource for professional pattern designers too. This shape collection was updated when the Design Book was added. Download the new version (no need to re-order), and order the design book too (free). 2 The name changed from Drunkard's Path 12 inch to Drunkard's Path 3 inch.